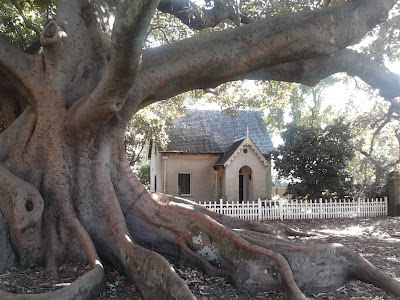 I always enjoy visiting this magnificent Moreton Bay fig tree, which stands in the grounds of a church in a crowded inner-city suburb of Sydney. The tree was planted in 1848, apparently to commemorate the completion of the roof of the Lodge, the quaint little building behind the tree. The roots of the fig tree are wonderfully gnarled and twisted, as though giant hands have kneaded the wood like dough. When you stand among the convoluted roots it feels as if the tree is embracing you. It's the kind of tree that reminds me of Enid Blyton's Magic Faraway Tree. Oh wow, that tree looks amazing and so beautiful. I would love to see this myself.